Just wanted to take a second and introduce myself. My name is CJ Johnson and have been out of club racing roughly 12 years but the time has come. I recently moved 5 min down the road from road atlanta which has added fuel to the fire. My question is if anyone else is near me ? I am a mustang guy so looking at them more specifically. Also, looking to see first hand the amount of prep that goes into these cars. My goal would be get a solid car together or bought to get seat time then go from there. My advice is to please buy a car as a starting point and go from there. There are a bunch of cars out there you just have to find them. Get something you can get on track and then get going on improvements. Welcome to the madness. I am not exactly close, but at least I am in the south east. Based out of Apopka (Orlando). I agree the best way is to buy a car, you will spends pennies on the dollar compared to building one from scratch, and get on the track much faster. I build my own engines, transmissions, rear ends, cages, etc. It can be done and these cars can be very reliable. I am a fairly fast regional guy, but a middle of the pack national guy (on my best day). If you have any questions I would be happy to talk with you and give you my opinions (everyone in AS has them). PM me and I will give you my number. Overall this is a great class with awesome people in it, I only lament I missed the days of 8 and 10 car fields at regional races. Here in Florida its hard to get more than 3 lately. But still a blast. I am all for buying a quality car at a good price but unfortunately ive always ended up with other peoples problems or issues. I also, typically build most of my stuff. so im not intimidated the least at a build. If anyone knows of a good regional car im all ears. I was actually thinking a restricted prep car for simplicity and seat time. Hi CJ, welcome to the AS community. I recently put my '04 restricted prep CTS-V A-Sedan up for sale (it actually currently holds the AS track record at Road Atlanta). PM me if you're interested in the car. I'm new to the site. I'm in the North Georgia mountains. Chevy guy (sorry). 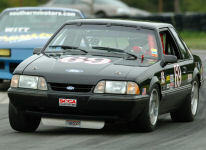 I teched for SCCA in the late 90's at Road Atlanta. Long story short - I bought an old, worn out - turn key Camaro out of New England. IMO it was priced as spare parts and the cost of a cage. I drove 1000 miles to go and get it. BAM. Done. I have 2 other shells, 1 of which was my halted construction attempt. I've aborted more than 1 attempt at building a car over the years. I backed off stuff in the late 90's because it appeared the car count for AS was "not good" in the SE. I hope me & you (and everyone else) can help fix that down here. I can tinker as much or as little as I want with my pile now. I need to put tires, a tank of gas and new brakes on it and I can show up and drive. I'm going to concentrate on driving (properly), getting licensed, and figuring stuff out, rather than get hung up on how slick or fancy my car is. My goal is to have fun. If Fred still has his Mustang for sale it would be a great starting point.